Do your elected officials know how you serve their constituents? Do you have champions for your organization? Are you prepared in the event legislation or policies are proposed that would adversely affect your museum? 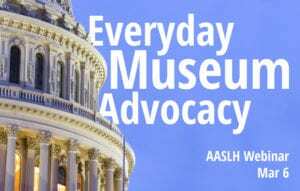 Advocacy involves communicating what your museum does and why it is important. Making advocacy a part of ongoing operations can help build a stronger institution. Staff at all levels, board members, volunteers, constituents, and the many people who value museums can all play a role. This webinar will cover what advocacy is and why it is important, and, through real world examples, address how advocacy is similar to both donor cultivation and disaster planning. Participants will learn how to do simple things to incorporate advocacy into ongoing operations and also how to engage in field-wide advocacy.